politicalbetting.com » Blog Archive » Does the Tory Lisbon referendum row matter? « Will Dave prevail against the Norfolk Nineteen? Does the Tory Lisbon referendum row matter? I’ve raised this before and will raise it again – the EU and other issues relating to Europe are not things that get voters wound up. 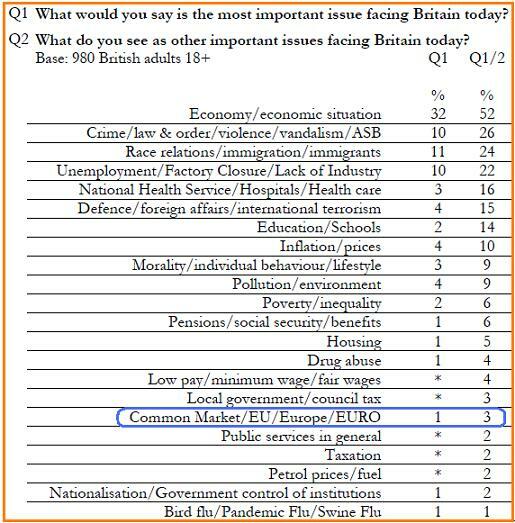 The polling suggests that this is very low down on the list of concerns. Above is the MORI issues index for October – a month that saw several days of the Lisbon treaty being the main political news when the Irish referendum YES coincided with the start of the Tory conference. It was also a month of highly concentrated attacks on the Tories over some of their partners in the EU parliament. If ever there was a period where the EU would register it would have been October. Yet what happened? Just look at the issues index – which is a unique monthly poll because it is entirely unprompted – and Europe barely registers. To the second question respondents are asked name as many issues as they want and even with this the category it only gets 3%. The Lisbon treaty debate is only important in what it says about how the parties handle things generally? How are the parties handling it? Do they sound plausible? The issue itself is largely irrelevant. We should get another round of voting intention polls this weekend and my guess is that things will look broadly the same. Meanwhile Ladbrokes have put up a couple of new referendum markets. Will there be a vote in 2010, on which you can get 8/1 and what are the chances of a referendum on any EU issue before 2015 – this being a 5/6 shot.